In large bowl, break up cookie dough. Stir or knead in flour and bacon bits until well mixed. Shape dough into 24 small balls. On ungreased cookie sheets, place balls 2 inches apart. Press deep indentation into center of each ball. Sprinkle crushed butterscotch candies into indentation of each ball, adding as much as you can before it spills out of indentation. Bake 8 to 10 minutes or just until edges are lightly browned. Cool before serving. Four slices cooked and crumbled bacon can be used in place of the bacon bits. The final texture of these cookies is slightly crunchy. 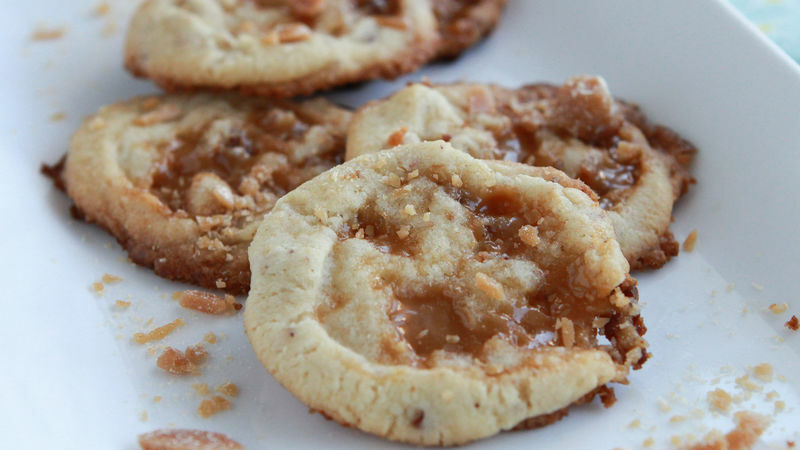 If you like the flavor combination, but prefer a softer cookie¸ also add 1 cup butterscotch chips to cookie dough before shaping into balls, and omit making indentations and omit adding hard butterscotch candies.